Bollinger said deciding when to denounce racist speakers is "a balancing act that everybody should follow and that I try to follow." 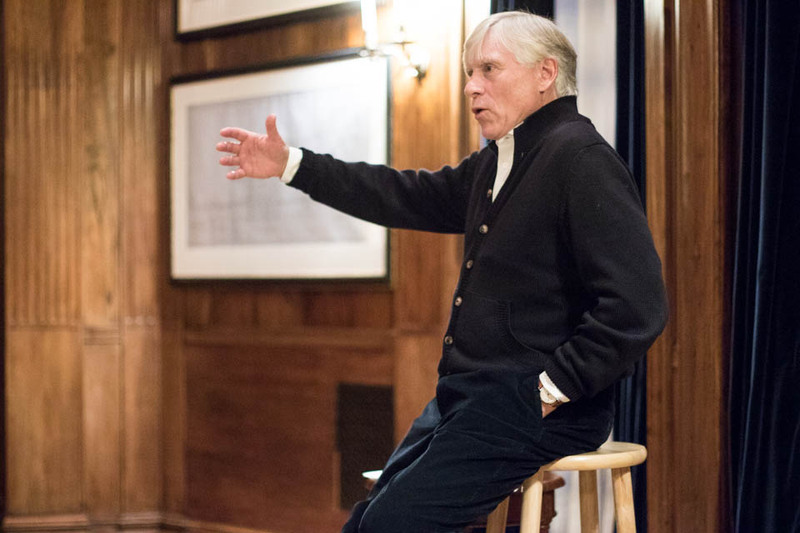 University President Lee Bollinger, a legal scholar of the First Amendment, discussed the state of free speech on campus on Friday in an interview with Spectator. Three days earlier, hundreds of protesters disrupted an anti-immigration speech at Columbia by the white nationalist blogger Tommy Robinson. The following are excerpts from that interview, slightly edited for content and clarity. Spectator: Controversial speakers, including white nationalists, were invited to campus in recent months. A lot of students have responded with protest, and there have been calls to shut down the speeches based on the claim that the speakers’ language shouldn’t be protected because it’s directly threatening. Does any of this concern you? Bollinger: This one I’ve thought about a lot. … We’re just not going to be a place that allows speakers to be shut down or disrupted. We’re just not going to be that kind of place. … The University, over many, many years, has embraced this idea that in public discussion of public issues on the campus, students invite speakers, faculty invite speakers, schools invite speakers, and so on. We’re simply not going to let the people who are offended by the messages—even reasonably offended by the messages—to stop the speech from happening. It is reasonable to argue for a different rule. People say, “Inviting people in who advocate hatred, advocate prejudice, advocate bigotry—we shouldn’t allow people like that into the academic community. Nobody has a right to be invited, but we should have norms about this.” That is a reasonable position to take. There are arguments you could make about it that are very sound—the arguments are like, “It’s great [to build] character by having to respond in an intellectual capacity, but the people who are hurt in this are always the same people.” There are a whole set of arguments on this that are totally reasonable to make and powerful. So I’m not troubled by people saying we should have a different rule. What I am troubled by is when anybody takes a position that we will not follow the principles that have been agreed to, and we will not allow the institution to act on those. You want to argue for a change in the principles? Great. We should always be open to thinking about the principles. But you can’t stop the University from following those principles. Spectator: One thing that you argued in your Columbia Journalism Review piece this month is that protections of speech are only sustainable if people understand that officials are condemning the hateful speech that’s being protected. What’s the best way for University officials to show to students that they’re condemning these ideas while they’re protecting them? Bollinger: Well, in that article I said what I have said many times: That there is a kind of ecology of freedom of speech and we’ve chosen over many decades to have a First Amendment that protects even the most vicious, really offensive speech. We’ve chosen to do that. We have to have reasons for it and people have debated this, including me, but part of what makes it work is an understanding by sane people that these are bad ideas, and that has to be done by leadership. And I try to do this, as the leader of the institution, I try to articulate what I say about immigration, about racism, about any number of things. So I think that’s all part of the ecology. However, you can’t be successful in that ecology if you have to speak out every single time something happens—people no longer pay attention, it becomes itself a chilling effect. So it’s a balancing act that everybody should follow and that I try to follow. Spectator: So you set out those two principles: On one hand, you have to address “bad” speech with more speech, but some could argue that within academic settings there are some viewpoints that just don’t belong in a discussion. Bollinger: Yes, that’s not my view. Spectator: Right, so can you take us through your reasoning? Because I think a discourse that has come up on our campus—and campuses across the country—is the idea that some speech, even if it’s not inciting violence, inherently holds this violent ideology that shouldn’t be accepted on campuses. Bollinger: I mean, I think that’s true, I think speech can do all kinds of bad things in a society. I think it can reinforce prejudices, it can stimulate prejudices, it can foster ignorance. Bad speech can do very bad things, and one of our problems often is that free speech people underestimate. They say, “It doesn’t matter at all” or “ignore it.” That’s never been my view. My view is that bad speech does have very bad consequences. But we are trying to create an environment in which all of us recognize that as a society, as a group, we have some bad impulses. Even those of us who oppose the ideas for good reasons, we think, and don’t want a world like they want—we can react in excessive, bad ways. And that kind of impulse to be totally convinced you’re right, to want to crush dissent and crush people who do bad things, that’s an impulse that’s also very bad and very harmful and that needs to be addressed. … I think there are powerful cases to be made for this, people can have different views of it, but I am not one to underestimate the harms that speech can do. Spectator: In the classroom, a lot of this is couched in discussions of safety. It’s hard to take an academic approach to refuting someone’s admission that certain speech causes them pain or distress. So I’m wondering, from the standpoint of students and faculty members, how do we broach having these conversations in a way that’s going to be productive, in way that doesn’t make students feel like it’s incumbent upon them to be the contrarian voice? Bollinger: That’s very interesting, and my response is that what you have just described is the most powerful reason I can think of for pressing ahead on this. Any time you’re in a conversation and are like, “Oh my God, I can’t broach this, I can’t take a position here,” that’s where the education is. That’s what it means to be a creative, free-thinking academic. That’s why academic life is so exciting and engaging and productive. It’s because there are people who are brave enough and it puts us in a position where we have to ask ourselves, are we brave enough and how would we talk about this, how would we figure it out, and am I persuaded by this? So I think it’s a wonderful example where that is the reason for having free speech. Very active arguing about free speech is, to me, the example—it justifies it. I confront this in my class, I teach my class in part to do this. I try to write about this, I try to speak about it, in my fireside chats I wait for this type of thing to come up. Maybe I could do more, maybe I could have a town hall meeting, maybe I could kind of open things up. Spectator: Regardless of whether there’s an actual increase in First Amendment debate on campus, we hear talk of students policing themselves in the classrooms in terms of what they feel they can or can’t say. In your experience, is this actually a recent shift? Bollinger: So I’m asked this question all the time: What is going on on campus? Are students more hypersensitive to anything that offends? Are they less accepting of freedom of speech and academic freedom than before? If so, why is this? Is it because they’re all on social media and all talking to people who are just like them? And my answer is, I don’t see any difference. I think everybody’s natural impulse is … to be naturally intolerant. None of us likes to confront ideas that we disagree with. What Trump is, is an atavistic—he just says, “Be like your instincts,” and lots of people say, “That sounds great, I’ve been waiting for somebody to say, ‘Why should we be civilized?’” It’s hard to be civilized. It’s important to be civil, it’s important to engage with other ideas that you don’t like—that takes work. And I think students today are no different from students 10 years ago, 20 years ago, and 30 years ago. I think most students, by far, understand intuitively or explicitly that they want to be challenged, that they come to a university because it’s not going to be easy to think through ideas. And then there are some, but I think a very small number who say, “I think I’ve already figured out what’s right and wrong, what’s true and false, and my job is to advocate.” I don’t think there are very many like that. That’s my view.